All varieties of tomato plants fall into one of two basic types: determinate and indeterminate. Determinate tomato plants grow for only a short time, bearing fruit for just one season. 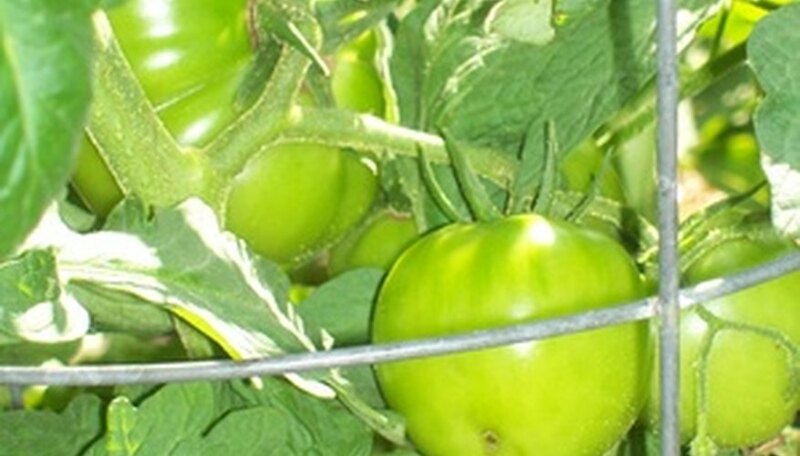 Indeterminate tomato plants bear fruit for season after season, and with proper care will survive through the winter to produce tomatoes again after the weather warms up. If you have indeterminate tomato plants and want them to survive winter, here are some tips to help you keep them alive. Prune some of the leaves from your tomato plant during the fall. Concentrate on removing leaves that block the sunlight from developing tomatoes, so that the tomatoes will develop before winter weather arrives. Sunlight doesn't make tomatoes ripen more quickly, but the sun's warmth does. Prune off all the tomato blossoms that have not yet set fruit. This prevents new fruit from developing, and allows the tomato plant to concentrate its energy on developing the existing fruit. Place the blade of a shovel 1 foot from the main stem of the tomato plant. Push the shovel into the earth, to sever the roots. If your winters are severe, repeat this around the perimeter of the plant. According to Tomato Gardening Guru, this action shocks the tomato plant, which makes it ripen the existing fruit faster. The shorter root system also requires far less water, which is essential in helping a tomato plant go into winter dormancy. Place 3 to 4 inches of chipped wood mulch around the base of the tomato plant. The mulch serves to trap warmth and protect the plant's roots from severe winter weather. Cover the tomato plant with sheets or light blankets when the weather dips to 32 degrees Fahrenheit or lower. Use a cage or stakes to create a tent, and secure the ends at the base of the cage or stakes with twine. In cold, wet weather, use sheets of plastic or oil cloth to keep the sheets or blankets dry. For tomatoes grown in containers, Edible Container Gardening suggests dragging the container into a garage or other shelter during the winter. EdibleContainerGardening.com: What is the Difference Between “Determinate Tomatoes” and “Indeterminate Tomatoes”? EdibleContainerGardening.com: What Vegetables Can Be Grown In Containers?